Meet and Greet events are the modern-day fans day for the little ones. My kid has been to quite a number already, and we event travelled far and near for these events. Fortunately, Toy Kingdom has had several of such events in the past couple of years, such as Sofia the First, Doc McStuffins, Jake the Neverland Pirate, and the Arendelle Sisters Elsa and Anna, which was a perfect fifth birthday gift to her last year. This weekend, our favourite patrollers will visit the Mall of Asia, and we’re all invited to attend this fun day of activities. 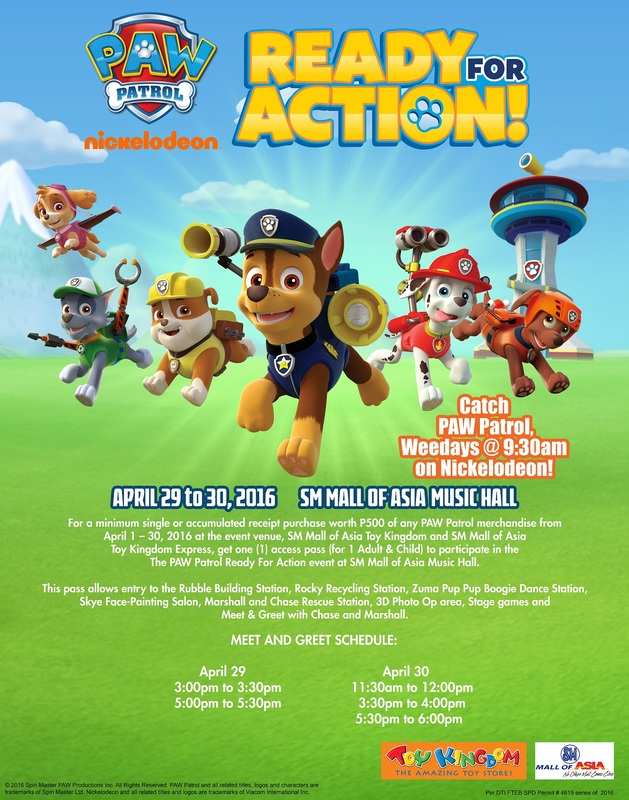 For a minimum single receipt purchase worth P500 at Toy Kingdom and Toys Section of The SM Store, customer will be given a stub by the sales personnel on duty.The stub will serve as the ticket to enter the Paw Patrol Ready for Action Event on April 29 or April 30, 2016. • One stub can accommodate one child and one adult.Only purchase made from April 1 to 30, 2016 can be accommodated for the Meet & Greet schedule. • Photo opportunity with the Paw Patrol characters will be done on a per batch basis. Total of 3 to 10 individuals can be accommodated every 3 minutes. Maximum of 100 individuals can be accommodated per Meet & Greet schedule. • Should there be more than 100 people in line, they will be prioritized for the next meet & greet schedule of their choice.All stubs must be surrendered and valid for one time use only. Stub is not replaceable once lost. You got the details, now we’re Ready for Action! See you this weekend at the Mall of Asia!